Slightly spicy and very satisfying! Alex and I love Thai food, but we are not fans of the added sugars, peanuts, and industrial seed oils that are often used in Thai restaurants. This soup is a great make at home meal to appease the Thai craving. I used fish (Mahi Mahi) as the protein in this batch, but chicken or shrimp would work as well. Homemade bone broth adds a delicious, comforting flavor as well as a host of health benefits. Please see the above link for further details on all the goodness of stock. This is a one pot meal that is equally delicious and satisfying on a cold winter night or a sunny summer evening. Enjoy! In a large sauce pan or stock pot, stir together the broth, garlic, chiles, ginger, lemon and lime zest, lime juice, and fish sauce. Bring to a simmer and then add the fish, chicken, or shrimp. Also add in the mushrooms and coconut milk. Return to a simmer and continue to cook until the meat or fish is cooked through. The fish I used was done in less then 5 minutes. Add the spinach to the pot and stir to combine. Once the spinach wilts, remove the soup from the heat and serve. Top with optional garnishes. I found that the soup was perfectly seasoned as is, but taste yours and adjust with additional fish sauce or sea salt as needed. 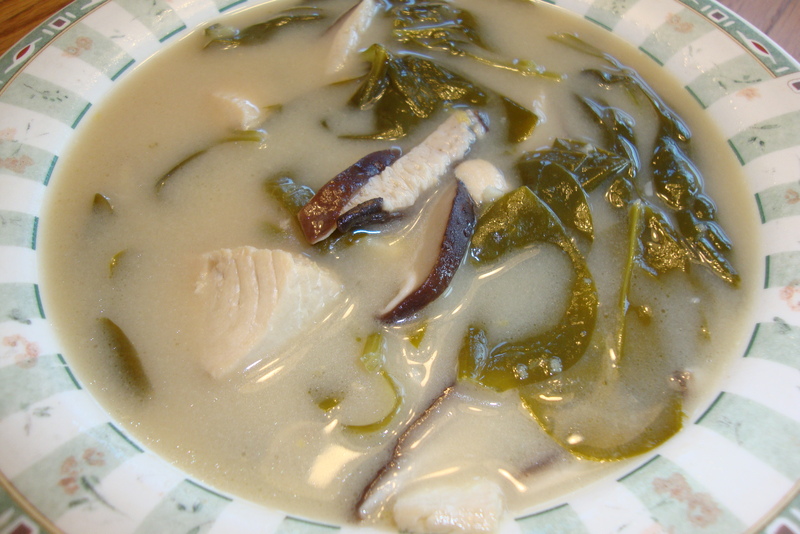 Chicken, Coconut milk, Fish, Garlic, Ginger, Lemon, Lime, Mushrooms, Spinach, Stock. Bookmark.